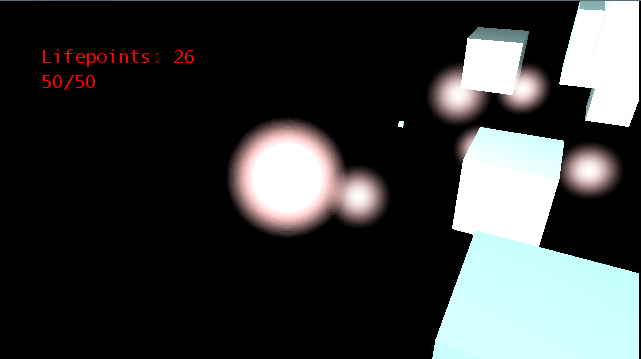 I have a small test environment where small point lights are scattered. Players should able to collect them. The collectible lights are rendered using a simple billboard technique where two triangles with a uniform color are rendered facing the camera and a gaussian is used as an alpha-map. When a player collects a light, the idea is that the collected light is merged with the lights he already has collected. The players are currently rendered with the same method as the collectible lights, the collected light has influence when the lighting is calculated => higher light intensity. The process of the light merge could for example be visualized in a way where all collected lights circle around as small pulsating glowing particles - sticking together to some extent - maybe some nice lines which travel with them - you know, like such a thing should look like if it is a central part of a game. The problem is that I don't really find many resources over advanced shader effects. Most information found is over the basics (diffuse / specular shader - maybe some blurring) or does not involve the HLSL language which I use in XNA 4.0. I would appreciate any links to resources which could help me making more awesome light effects which could actually run on the xbox without running into performance issues. Basically, any techniques which involve rendering cool light orbs / beams etc. would be fine for the moment if the result i visually appealing. Neat idea for the game. The problem is that light really doesn't look like this. Light decay is NOT gausian :). That's for the begining. What i want to propose is adding simple (but relatively physicaly correct) fog or dust. Mean volumetric effect. You will have to implement volumetric raycasting on the gpu. Don't panic. It is not that hard as it might sound. What do you see here is fog (or dust) containing lights. Lights are represented only by their position, color and intensity. They have cubic decay, which looks natural and fits to the definition of the Radiance. Lights has different intensity, exactly what you wanted. shadow = getShadow(samplePoint); //like regular shadow mapping, you have world space position and want to know if there is shadow or not. color.a += (1 - color.a) * (1 - opacity); //opacity is the same in your case. If rendering something like clouds it is loaded from the 3D texture. I suggest value like 0.01 or similar.. It is not hard actually and can be done as a pixel shader (offscreen). You have to stop sampling rays at z-buffer value (so it has to be applied after the opaque scene render). And alpha blended with opaque scene render. It is pretty solution to this. It also attenuates lights which are far from player, solves the intensity correctly and i think it looks cool. For more info you maybe like read my paper about implementation of volumetric effects into game engine (well something similar to game engine :)). There is also awesome book about volumetric rendering. I'm in love with it. Also this site contains pdf tutorials which are quite good introduction to the volume graphics. (hmm those gifs are too low quality that there is no significant difference). edit (some performance notes): it can be done as one pass per light, which is usefull if lights has lots of aditional textures (light color - projective texturing, intensity curves etc.). But this is frame rate killer, it can (and should) be done in one pass for all lights if you have enough texture units available (i think you have in your game). Than it can have about 45-60fps i hope. Sampling doesn't have to be linear. You can make sampling logartmic (or similar function). where delta is difference between step1 and step2. And if you dont mind little noise, you can add depth jittering which allows you to use much lower number of samples (that is pretty good and easier solution). Motion and such will help, but what it sounds like might be an answer for what you're going for is a way to cause them to look more "glowy". The key to making something look more lit in your scene is by darkening everything else. From there little things like over-saturation of color (leading to light colors washing out to white) and just plain being more lit than the ambient scene will do a lot to add to the effect. One of the easiest and least intensive ways I can see to get this effect given what you have described would be to go with an additive blend with the scene. Make your individual motes of light have a 70-80% alpha center, before lowering the alpha rather quickly as you travel outward. Make sure if you do this to leave a rather wide (2-3x size of center) ring of very low alpha. Now this area will be almost imperceptible when blended with the scene alone, but as you gather multiple together, the different slightly shaded areas will overlap causing a more general glow to the whole collection. On top of that, the field does not have to be uniform, and you can leave streaks of slightly more alpha areas in the texture to cause light beams to be hinted at. You'll probably want to rotate the texture over time so the lines don't look static, but overall the effect will cause the bits of light to look more like just that and less like little floating balls. Hopefully this helps. It's not exactly advanced shader work, but I find sometimes the more simple effects can give a quite satisfactory look. Consider throwing in a soft particle effect as well to allow the lights to leave slight trails or other effects in the player's vision. Happy coding! Not the answer you're looking for? Browse other questions tagged xna shaders xbox360 lighting hlsl or ask your own question. How can I convert a mouse click to a ray? How can I perform a masked erase in SDL2? Why would an ambient occlusion (AO) shader's performance be dependent on light direction? How to sort tiled decal list?